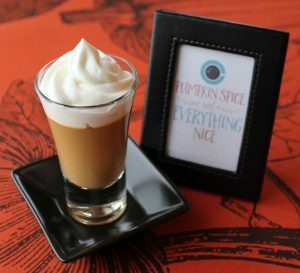 This pumpkin spice latte panna cotta couldn’t be simpler. If you are looking for an elegant but ridiculously easy dessert for Thanksgiving, this is it! It can also be made a day ahead, which is an added bonus. The cute pumpkin spice printable is from a blog called Lost Bumblebee. I thought it was the perfect accompaniment to the dessert! Cool the latte to room temperature. Sprinkle the gelatin over the top. Make sure all of the gelatin is touching the liquid. Let sit for about 3 minutes to soften. In a small saucepan, bring the mixture up to a simmer. Pour the mixture into a vessel with a pour spout and pour into your desired containers. Refrigerate until set, or overnight. Serve chilled, topped with whipped cream.